Over the years I have been to most of the International rallies but always had a good size bike to do it with starting of with the VN1500 classic tourer (commonly called the Nomad) then the VN 1700 Voyager-and if there was ever a bike built for euro touring it’s the Voyager. But last year I began to find the Voyager a bit heavy to lug around when stationary (its 410 kg dry! And I am not getting any younger!) So took the decision to down size and not being one to do things in half measures went all the way down to the Vulcan “S” 650. Any regrets? No, none what so ever, last year we went to the Rally du Aquitaine (near Bordeaux, France) which was fine but no great distance so this year was going to be the test would a little 650 be able to live with the 900,1600,1700 and 2 litres? Well here is the result. Every year the VRA has an international rally it started 11 years ago in Holland and has just grown from about 100 bikes to the 700 plus this year in Algentario (which is about 70 miles south of Pizza) the decision as to who will hold the rally is taken by the presidents at their meeting held at the rally every year and is for three years ahead so this year the vote was for 2019. Any country can put in a “bid” (not the financial meaning) if more than one country wants that year majority vote by the president’s gets it. This way we all know three years in advance who is holding the international that year. Next year is Denmark, 2018 is France and at this years rally Finland won the vote for 2019. We left Bristol June 11th at 6am!!! I don't do mornings!!! But with the news that petrol maybe short in France due to strikes and hold ups at the tunnel we started off early. 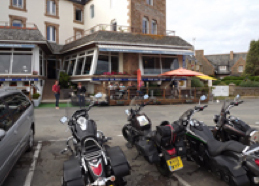 First Day was Bristol to Cambrai about 200 miles motorway all the way via the Chunnel, we were a group of eight bikes, Jeff VN 2ltr, Den, little John, Richard & Steveo on VN 900’s, Pete VN1500 nomad, Vito VN 1500 mean streak, and myself on the Vulcan ”S” 650. Richard and Jeff both had there other half’s on board (Jean & Rachel) we kept the speed between 60-70 (about 5,000rps on the 650) all the way and I got to Cambrai on one tank of gas that’s just short of 200 miles with a 13ltr tank-happy with that. The day was pretty uneventful dry but over cast and we just wanted to get the trip started. Eastern France is basically flat agricultural land and unless you are looking for the First Worlds War battle sites not very interesting, so pushing on was no big deal. 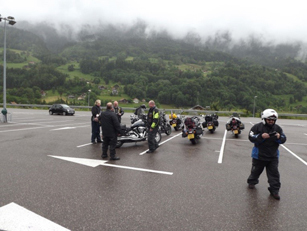 Day two was again about 200 miles to Dijon and again mostly toll roads/motorway, the weather was not very kind with a constant drizzle and misty. 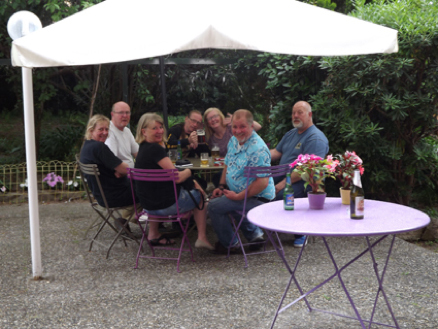 Day three was not much better as we headed to Manigod in the French alps where Richard, one of our party has an extremely pleasant-slept 8- flat, with a very nice restaurant/bar underneath the block so all needs were catered for. The only problem was actually getting to Manigod it would have been wonderful if it had not rained all day. I can’t remember the last time I was out in such awful weather. I could not see Jeff in front of me except for his taillight! (Would not have said it was heavy rain but two Cod and a very bewildered Pollock swam past us!!!). Still we made it. Day 4 at the flat, became a rest day, admittedly we hoped to ride the local lakes and stunning scenery but all we could see was rain and heavy mountain mist, that cleared momentarily to allow a quick photo or two so we stayed in only going out to the restaurant for dinner and a few drinks. Stunning meal on both nights and at a very reasonable price, it was so good of David the owner-and a friend of Richards- to open up for us their season had not started yet and usually they only opened at lunch times. 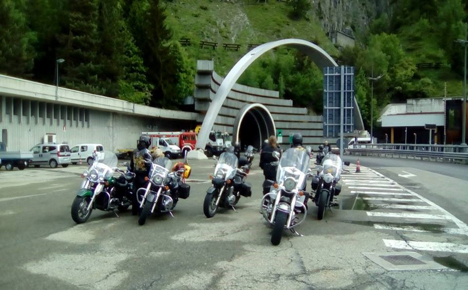 Day 5 and the Mont Blanc tunnel (€28) a lot shorter than I expected but another tick on the bucket list. 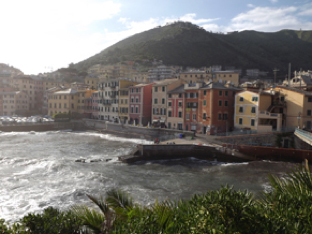 The good thing was the weather cheered up and it was dry all the way to Genoa (another toll which left us €35 poorer!! ), mind you with the number of Tunnels along that stretch of road we would have had difficulty getting wet anyway! Our hotel was in Nervi-a few miles to the east of the city- lovely hotel, it was a fifteenth-sixteenth century villa and some of the wall and ceiling art was still visible. Day 6 and we reached the rally site. 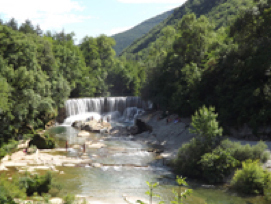 Richard and his wife detoured into Pisa, while the rest of us headed to the site for the rally, again we stayed on the motorway although it was very pleasant scenery and travelling at our usual 60-70 MPH we could take it in at our leisure. 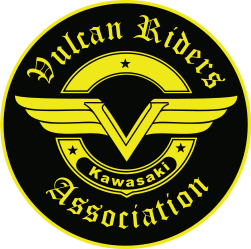 The rally was usual format and the video does it more justice than I can (vimeo tap in “Vulcan Riders Italy 2016”). Excellent rally, lovely site, nice accommodation (cabins along the beach) and very well organised by the Italian VRA but all too soon it was Sunday and we had to leave. Before I move on from the rally I must mention a personal event. The Saturday of the rally happened to be my birthday and I really thought I had got away with it until the evening, when, just as I were finishing my evening meal, the British contingent started to sing “Happy Birthday” and then parade a rather lovely cake around the hall this was then deposited in front of me by Badges-who God bless him had spent half the day trying to find said cake!-the cake was duly cut up into as many pieces as was possible and very nice ( Nice? No excellent is a better word) cake it was too. Later when Badges was on stage giving his Speech he again wished me a Happy Birthday and said some lovely things about me-luckily to save my blushed I missed that bit as I was at the beach to watch the fireworks. Still it was still very nice, and I was honoured to have such nice things said about me by the British and World president-thanks. Jeff headed straight home the quickest way possible as he had news that his Father had died so he had to get home ASAP. The rest, that’s all but Steveo and myself, went back the way they came over the Alps. On the Monday Lord and lady Malvern went their own way although heading in the same direction as us they took a different road. 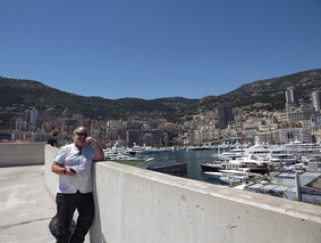 Steveo and I headed to Monaco,- what a Hole!- full of a lot of very expensive cars and even more expensive boats but the rest was just high rise blocks crammed into very little space with beautiful old villas dispersed amongst them. The worst thing was the roundabout in a tunnel!! Yes, and SatNavs don't work in tunnels!! Shall we say a sphincter seat grabbing moment?!! But we eventually got out and headed for the route du Napoleon a great road which every biker should do at least once. 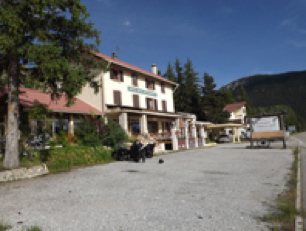 Our hotel, which was excellent, south of Castellane and was in the middle of nowhere (www.lerelaisdelartuby.com); a really nice place the owner spoke English and was a biker so we got on very well, he even let us put the bikes in the garage for the night and did us a deal for evening meal and breakfast €25 worth every penny (I think the room was about €50). 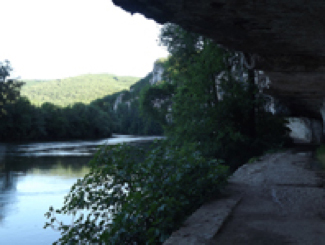 Next day it was the Gorge Du Verdun, stunning absolutely stunning, don’t have the words to describe it, just unbelievable and the road along it are just wonderful. The hotel owner told us how to get to the road on the south side of the gorge. Most tourist use the northern one, and he was right unforgettable. 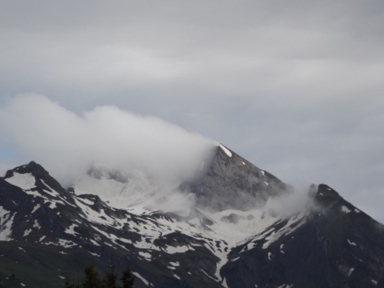 Wherever you looked was wonderful scenery and complete emptiness I could not believe we were in a modern European country, it was what I would have expected in the wildernesses of Canada or USA. 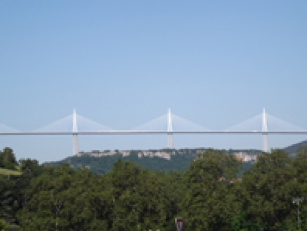 We then headed across country towards the Millau Bridge to get there in time to book into the hotel we had to sink down closer to the coast and take the toll/motorway but it was only about €6. Mind you first we had to get to the motorway. The road we wanted was blocked so we had to take a detour which was about two hours of small “D” roads some of which were covered in nothing more than loose chippings, but God what roads, OK no good if you wanted to make progress but still stunning with “S”bends, switch backs and scenery to die for –wonderful. Eventually we got to Millau found the hotel, which was unusual, being a number of cabins behind a gym, but comfortable and cheap. They did not have a restaurant but we found one just down the street, which served good food, and we could have a drink before turning in. In the morning we paid the €6 to cross the bridge stopped at the viewing point for photos (another tick on the bucket list). From there we headed for the west coast again following some excellent roads that were built for bikes. We stopped once more before the coast at Bouzies another of Steveo’s finds, fabulous little hotel (hotelfalaises@gmail.com) next to a beautiful river, which we had a great walk along before supper, again just a wonderful place, which I would not have missed for the world (in fact I have promised myself a return trip). Next it was the coast and a little place called Ares- took us three hours to find the hotel as the SatNav coordinates were wrong, still we found it eventually, we were looking for a hotel when in fact it was a private house doing B&B. But the welcome was warm, the landlady spoke almost as much English as we did french!! But it was excellent –especially the breakfast continental it might have been but there more than plenty. 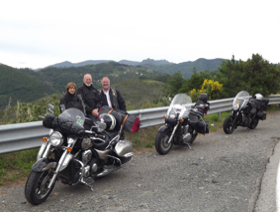 Next day was Friday and we did the 51 miles up the coast to the Rally Du Aquitaine at Montilivet where we met up with six of our club members who for various reasons could not afford the time off to go to Italy but still wanted a continental trip. 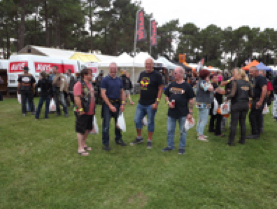 Again a great rally been a couple of times before and its always a good show with some super bands, one of the best this year was the Phil Campbell band (lead guitarist with Motorhead) excellent, enjoyed that immensely. 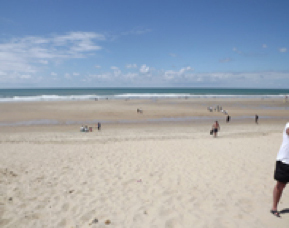 All over far too quickly we had to leave Sunday morning to get to Nantes, then up to the north Brittany coast where we found some wonderful little bays and another hotel off the beaten track but well worth finding (www.hotel-desrochers-perros.com). Tuesday Roscoff the ferry and home landed Plymouth at 20,00hrs rode up to Mums in Minehead, stayed the night then came home on the Wednesday. So what of the little Vulcan ”S”? Total mileage 2,900 probably the best riding holiday I have ever had and that is saying something as we have had a continental tour every year since 2000. 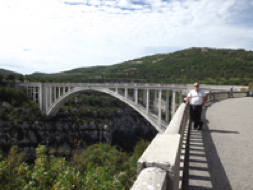 Especially the week Steveo and I were exploring southern France that was just brilliant. My little 650 did not miss a beat and to be honest some of the roads we travelled I would have found very hard work on the Voyager due to the very tight bends and appalling surfaces. As I said at the start of this piece first day was from Bristol to Cambrai in France I did it on one tankful-191miles-whats not to be happy about with that? When I filled up I still had a litre left so could have done 200. Rest of the trip we were filling up about every 100-120 miles (we had a couple of 1500 with us which are not so good on fuel) I was putting in about 6-7 ltrs each time. We were doing between 60-70mph all day long (just below 5,000rpm) with a few faster overtaking moves thrown in, this made the petrol consumption excellent, difficult to put a price on it as Petrol in Italy is very expensive (I believe Norway is the only country in Europe more expensive). But certainly it proved to be a very economical bike. Would I do the trip again on the “S”? Yes, tomorrow without any hesitation, there was nothing the bigger bikes did that I could not do. With the panniers I had plus a bag on the rear rack and a small holdall strapped over the pillion seat I had ample room for all the cloths and stuff you need for two weeks in the saddle. This brings me to question of carrying a pillion; no problem at all except I don’t think there is enough room for she-who-is-to-be-obeyed plus clothes for two weeks for the two of you. Remember I have come from the Voyager, which has enough carrying capacity for a month! To get over this problem the best solution is have an “S” each!! 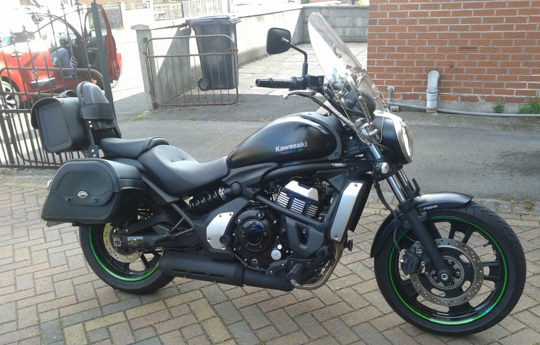 I think Kawasaki are missing a trick with the Vulcan “S” they advertise it as a good bike for beginners who have just passed their test or Lady riders, its far more versatile that that. I am shall we say an older rider with best part of 40 years experience and the “S” suits me down to the ground it gets me around town, it carry’s all I want for either for a weekend away or a trip like I have described. Its lightweight allows easy movement when manoeuvring to park, the engine and gearbox are a delight-none of the “clang” when changing gear as with the big VN’s-It goes where you point it, even the tyres I found impressive (Dunlop’s) and I am not usually a fan of the brand. Have just had a new set fitted but this time I am trying Avon Storms, we will see if there is any difference. That brings me back to the question posed earlier what was I talking about when I said “up to 80 miles fine….. 100 absolute limit”? It was The SADDLE, after 80 miles my backside was knitting buttons!!! The seat seemed to put pressure on the coccyx bone and there was not much “shuffle” room. So since I got home I have been looking into what is available, I have tried gel seats and found no difference and I am at present trying an air pad (Air hawk) which certainly makes it better. Kawasaki does a seat for the “S” with a gel pad in it for the taller rider but its £170 and if it’s no better it’s a lot of money to waste. Corbin has recently made a seat but its £500 and again without trying it, it would be even more money wasted if the problem has not gone away (it’s a pity there is not a business that hires out seats, windscreens, panniers etc so you could try before wasting a lot of money on something that may not be any better than the original). Still the hunt goes on. Will I be changing the “S” soon? No way, my little “S” and I joined at the hip and long may it last. Now lets see if we can do something about that Bl***y saddle!!! VRA © 2016-2020. All Right Reserved.